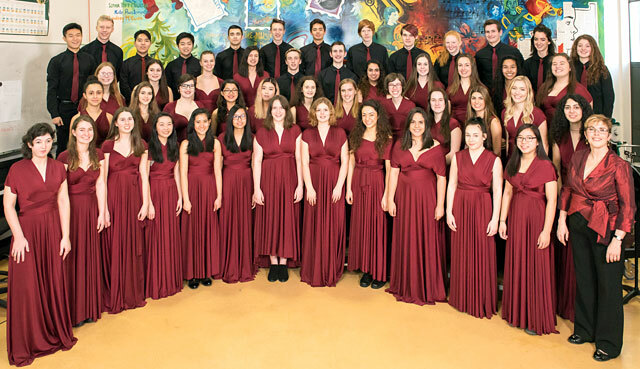 Argyle Sr. Concert Choir / Sr. Vocal Ensemble | North Vancouver, B.C. Argyle Secondary School is located in beautiful Lynn Valley, North Vancouver, British Columbia. The school’s population is approximately 1,200 students, and nearly 400 students participate in the music program. Argyle’s music department gives their band, strings and choral students a strong grounding in a diversity of musical styles and eras as well as basic music theory. Argyle students often have the opportunity to work with Canadian and international music industry professionals. Over the past 27 years, the music program has traveled extensively in North America, and to China, Finland, Estonia, Latvia, Italy, Croatia, Slovenia, Austria, Netherlands and Germany. The bi-annual trips to Banff for this festival are a major highlight for our student musicians. The Argyle Concert Choir is a non-auditioned Grade 11 and 12 choir class while the Senior Vocal Ensemble is an auditioned group of Grade 11 and 12 students. Both ensembles start anew in September and constitute the senior part of a larger choral music program of five choirs. Frances Roberts has been choral director at Argyle Secondary for the past 26 years and recently completed her Master of Music degree in Choral Conducting at UBC with Dr. Graeme Langager. She has had the great pleasure along with her choirs in 2007 of doing an educational workshop with the Finnish ensemble Rajaton. In 2010 they did a similar workshop with The Idea of North from Australia and in 2011 with the Swingle Singers. The Argyle choirs have worked with Simon Carrington, Bob Chilcott, Robert Sund, Stephen Hatfield, and Eric Whitacre. They have performed with the Vancouver Symphony Orchestra, Vancouver Chamber Choir and Vancouver Welshmen’s Choir. In April of 2013 they were fortunate enough to be featured in a Showcase Concert at the Canadian Rocky Mountain Festival in Banff, Alberta. We are thrilled to once again be invited to be a part of the Showcase Concert series in 2017.